Where will Bargnani end up? Let us know! Anytime a tall European prospect with deadeye shooting skills comes to the table, the unfair comparison to Dirk Nowitzki is sure to surface, but in the case of the potential of Andrea Bargnani, there are some striking similarities. Still very young and raw, the 7-foot Bargnani averaged 10.9 points and 4.1 rebounds in 21 minutes a night with Benetton Treviso of the Italian League. At his height and mobility, his most appealing trait is his quickness and long range ability, where he hit over 43% from three-point range. Bargnani has the potential to become a matchup nightmare, much like a Nowitzki. He can shoot it from anywhere on the floor and with those skills and the height of a center or power forward, he will create a lot of mismatches. Threes will have a hard time keeping him from getting his shot while he could blow right by most fours. Quick hands and feet. Decent shotblocker. Which position does he play right now? While he can create mismatches on the offensive end, defensively he can be exploited. Most power forwards will be too strong for him at this stage while he's not quick enough to guard an NBA wing player. At just 20 years of age, Bargnani must bulk up and get stronger, which will take time. 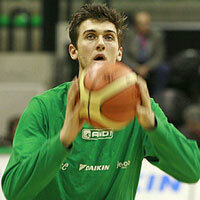 Andrea Bargnani on the Houston Rockets? The Rockets had little in the way of long range threats in 2005-06, so Bargnani would be able to provide immediate help here. Jeff Van Gundy has stated this offseason that he wants a power forward that can stroke it, and Bargnani certainly fits the bill, despite the fact that it will be a few years before he could mix it up down low. It's very unlikely that Bargnani would be available at #8, but if that were the case, it could be a potentially high reward pick for Houston.